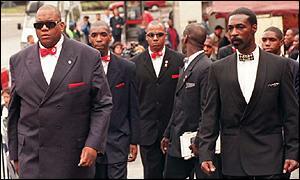 Nation of Islam members in their trademark bow ties and suits. The Nation of Islam (NOI) is a political and religious group with a race-based, black supremacist philosophy. The group was founded in Detroit, Michigan by Wallace D. Fard (a/k/a Wallace Fard Muhammad) in July 1930. It is active primarily in America. First, the NOI teaches that founder Fard was God incarnate and that Elijah Muhammad was a prophet. Traditional Islam teaches that no human can be an incarnation of God and that Muhammad was the last prophet. Second, the NOI teaches that the "blue-eyed devils" (whites) were selectively bred from blacks by an evil black scientist named Yakub, whose work supposedly took hundreds of years for him and his disciples to fully whiten his creations, with the intent to enslave the black race. Although traditional Islam recognizes a Yakub (Jacob, the grandson of Abraham through Isaac), they do not teach him being an evil scientist. Finally, due to the workings of Yakub, the NOI believes that black people are racially superior to other races, and that whites are not worthy to be converted (they believe Asian races were also created by Yakub as an intermediate step toward his ultimate end of creating the "evil" white race). Traditional Islam has no such restriction: it accepts members from all races and nationalities. The "Nation of Islam" is not Islam. The Nation of Islam: Fact or Fraud? The Islamic Garden. This page was last modified on 15 September 2018, at 22:59.